wow, a hijabi cowboy style! i like it! ooOoo Sophisticated. Love the khaki skinny's. Now this is all about accessories and proves just how much interest they can add to a simple outfit- from the brooch to her shoes, this muslimah certainly has an eye for detail and i'm loving it.. I LOVE THE TUCKED IN SHIRT, SOO STYLISH. 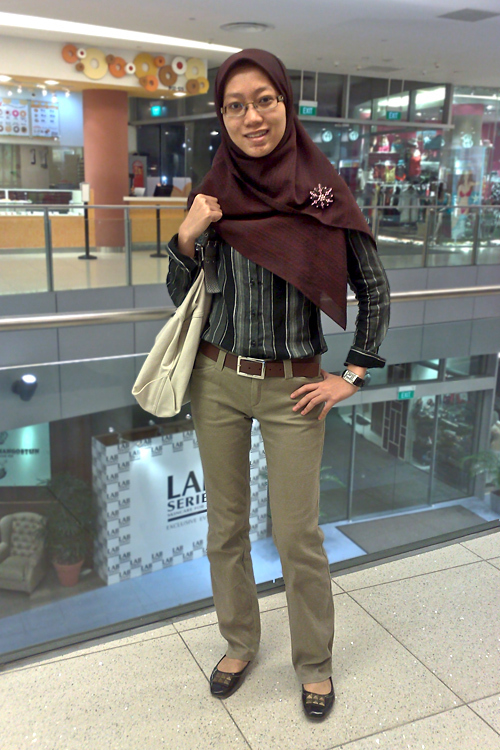 I love the way this sis has turned a very mascuiline themed outfit into a hijabi friendly one! Love it! :D Esp the broch and shoes, ahhhh! Muslim women and opressed? Pfft! Get some of this! answering the question to the anonymous poster above, it's because there are tonnes of shopping malls here. Shopping is our national pastime :) That, and eating haha! lovely pin used on the hijab! and this is a new style I've never seen before. there is only one thing I'd like to say about the outfit..
it's the pants that seem to be bothering me. They seem a bit tight fitting, like they are showing off her figure. maybe looser pants and longer shirt.